It's summer and peaches, apricots and plums are in full swing! Apart from eating them just as they are, this is our dessert of choice when it comes to stone fruit. 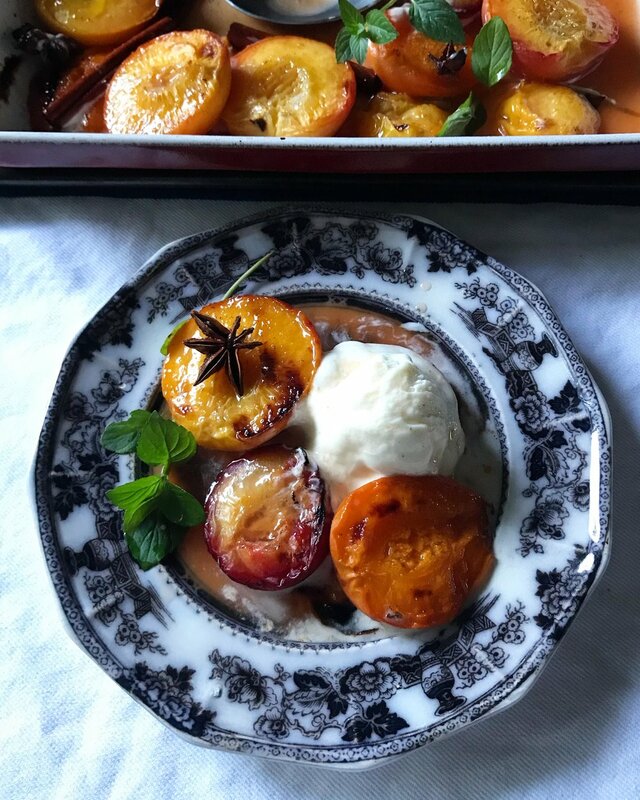 Scented with cinnamon, vanilla, cardamom and star anise, sweetened with honey and baked in a pool of grand marnier and rum - it all results in a fragrant and deliciously tasty syrup that is spooned warm over the fruit and ice cream! Quite dreamy, really! As this is more of a guideline and a loose style kind of recipe, feel free to use any fruit that is in season and looks fresh and ripe, then add any spices and liquors you wish to enhance it. Wash and halve the fruit, removing the stones. Prick the skins of the fruit in few spots with a point of a sharp knife or toothpick. Place halved fruit cut side up into a baking dish large enough to hold it snugly in one layer. Pour the liquors over the fruit, place aromatics in between the fruit (into the liquid), then drizzle with honey and lemon juice over the top. Bake for about 20 minutes (depending on the size of fruit), or until fork tender. After the fruit is done, turn on the broiler and place it under it until the top is nicely browned - more flavour! Cool slightly and serve warm with vanilla ice cream, spooning over some of those delicious juices and garnishing it with a mint sprig.